In this week’s Throwback we go back 22 years to 1996 and the rained out Memorial Day weekend Springfield Mile. 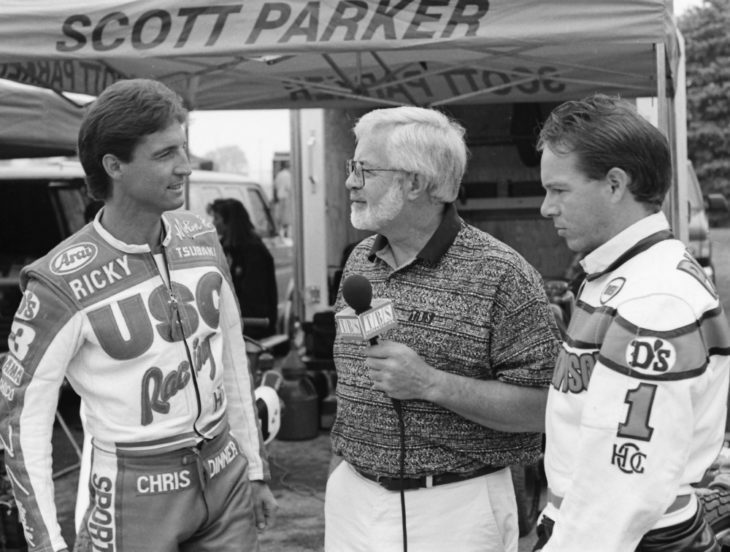 Even though the race had to be rescheduled, the TV crews were there and Larry Maiers (center) was able to interview two of the all-time greats in AMA Grand National (now called American Flat Track) Ricky Graham and Scott Parker. Parker would go on that season to win his seventh AMA Grand National Championship. In another couple of years after this photo was taken by Cycle News’ Scott Rousseau all three of these legends would be enshrined in the Motorcycle Hall of Fame.